White people are a majority in New Hampshire: here's why that's a problem. MANCHESTER, N.H. -- Catalina Celentano used to hold training sessions for hospital workers in Lynn, Mass., to familiarize them with the cultures of patients from Cambodia, Russia and the Dominican Republic. When she moved to New Hampshire, she suddenly found herself in an ethnic vacuum. "I went from being able to speak Spanish every day to not speaking Spanish at all because there wasn't anybody to speak Spanish to," said Mrs. Celentano, who was born in Colombia to a Colombian mother and Hungarian father. "The only person I spoke Spanish with was a cleaning lady and she moved back to Colombia." 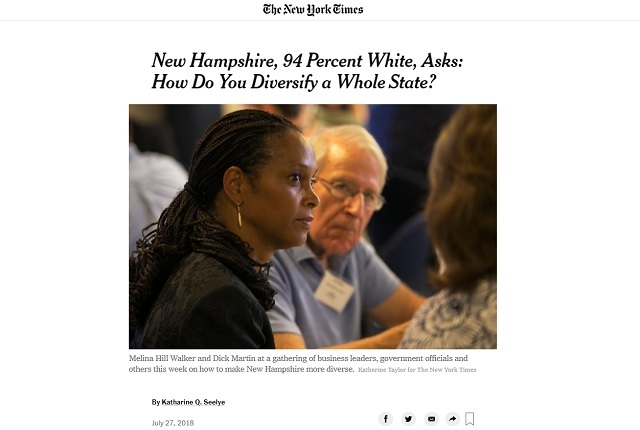 The issue prompted about 100 business leaders, government officials and members of nonprofit organizations to meet Thursday to search for ways that New Hampshire -- which is 94 percent white -- might lure other racial and ethnic groups, as well as younger people. Will Arvelo, New Hampshire's director of economic development, said the gathering appeared to be the first broad-based effort in New England, if not the country, to focus on how to diversify an entire state. 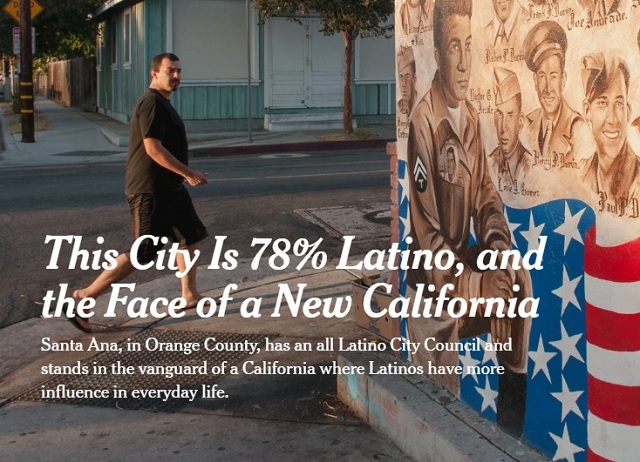 The power and presence of Latinos in this community in Orange County � itself once a bastion of Republicanism � is echoed up and down the California coast. Latinos now make up just under 40 percent of the state�s population, projected to increase to 47 percent by 2050. The leaders of both houses of the Legislature are Latino, as is the secretary of state, the current mayor of Los Angeles and the previous mayor. The need to "diversify" the city was not raised, in fact, the word "diversity" didn't appear once in the entire article.